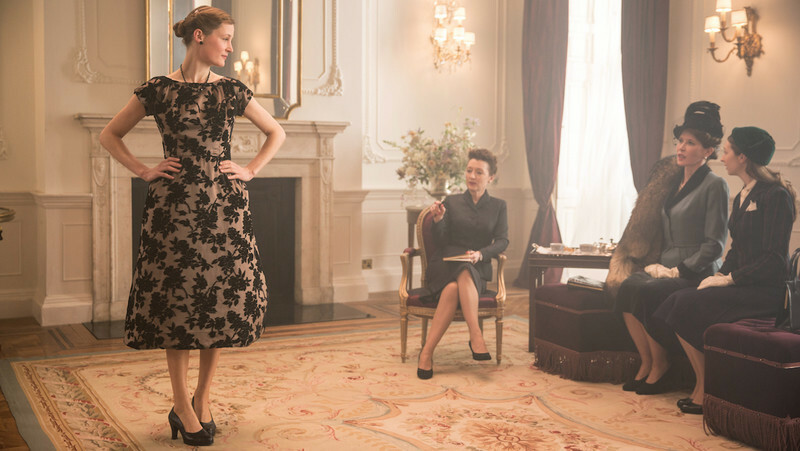 In Anderson’s sublime, unpredictable psychodrama "Phantom Thread," Manville plays Cyril, an unflustered and impeccably put together businesswoman in the world of the 1950s London couturieres. She smoothly runs “The House of Woodcock” alongside her brother Reynolds (Daniel Day-Lewis), the much-celebrated designer of the time and by all measures, a narcissistic "difficult male genius" figure who disposes of muses ruthlessly like last season’s garments. Yet, Reynolds can’t ever challenge or control the self-assured Cyril, who almost stands as a maternal figure to him. And his world turns upside down when a new muse, Alma (Vicky Krieps), enters the picture, complicating the house’s trusted rituals. Enjoying a productive, sweet spot in her career, Manville has had a very busy year juggling between various film, stage and TV projects and is gearing up for an even busier few months ahead with "Harlots," her Hulu series that is about to start production on its second season, and the commencing of rehearsals for her upcoming revival of the Eugene O’Neill play, Long Day’s Journey Into Night. 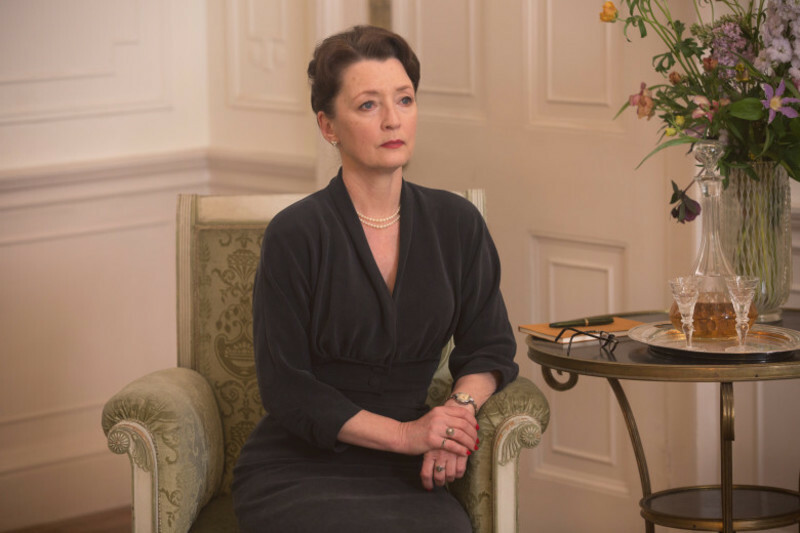 I spoke to the actress about crafting the character Cyril in “Phantom Thread” and the breadth of her current projects in her prolific career. How did “Phantom Thread,” the Hulu series “Harlots” and the upcoming stage play Long Day’s Journey Into Night, line up for you back to back? It's really complicated. We'd been trying to bring Long Day's Journey into Night into the West End since we did it in 2016 at the Bristol Old Vic. The offer has been there, but finding a time when Jeremy Irons is free, I'm free, and our highly successful director Sir Richard Eyre is free, has been almost impossible. In London you don't really want to do a play in the summer. It's hot, people don't go to the theater, or you're playing to tourists--with a heavyweight play like this, you don't want to do that. So we knew we needed an autumn or a winter slot. But I was contractually optioned to do the second season of “Harlots.” And I sat in my dressing room [while shooting “Phantom Thread”] thinking, "I'm not going to lose this play." So I phoned up my agent. I said, "If 'Harlots' can release me for three weeks to re-rehearse the play and open it, I'll then do both jobs at once." It will mean that there will be some days, not every day but some days, I'll be filming. Then they'll release me at 4:30, and then I'll go and do the play in the evening. I may not be alive by June, but I'm not going to be beaten by it. So that's it, that's what's happening. I am incredibly busy in the next few months. I start rehearsals [for Long’s Day’s Journey Into Night] on Monday. We're going to do it in the West End for 10 weeks. And then we're coming to BAM for a month in May, and then LA for a month. How did you come on board “Phantom Thread”? It was classic Paul. Once he knows his mind, that's it. I got a call from my agent saying, "Paul Thomas Anderson wants to ring you tomorrow morning at 11 o'clock." I thought, “I bet he won't call at 11. He's Hollywood. He'll just forget and then he'll call me at five or something." 11 o'clock on the dot, Paul rings! We immediately got on. He said, "I've got a script that I've written, I want to send to you." This was in June of last year. He said, "We'll start shooting in January." Said, “It's Daniel and I want you to play his sister." Obviously, I'm at a good place in England. I don’t really have to audition in England anymore. But if I were going to do a big American film with such a prolific and well-respected director, I would have thought the path to getting the role would have been quite arduous. But no, it was simple. So he sent me the script. (He DHL-ed it, he said, "I'm not going to email it." He didn't want to send it over the Internet, just so that it would get stolen or something.) He said, "Read it, and let me know, and we'll have another chat." That was it. I’m fascinated by Cyril. She is, for lack of a better word, a very even-tempered character, without a lot of ups and downs or dramatic jumps. But that obviously doesn't mean she lacks the range of emotions. What was your entry point into crafting the world and headspace of a character like her, who doesn’t express herself overtly in extremes? It's a very good question. I think the answer that people expect is, you make a decision and you stick it on. "Oh, I'll make her very strong and stoic and silent and all-knowing and still.” And I'll just stick that on her and that's what she'll be." But it doesn't work like that really. Acting happens in a much slower, much more organic way. Daniel and I obviously talked a lot in six months, talked things through. We instinctively understood the world that we were talking about. (Not so much the fashion. That's something that had to be researched.) But the world that these two siblings had grown up in, we knew the feel of it, the smell of it, the essence of it. Or ever! So it's slow, all that feeds in by a kind of strong osmosis. Then you start to shoot it. Paul doesn't like to rehearse and that suits me fine. So you get on the set, everything's there. You're in these costumes. Everything's right. The look of it all was very considered: getting my hair right, the color, the shape of it, the severity of it, all of that. The pristine-ness of it, the lips. You do all of that, and then you just start doing it, and you do lots of takes (because that's when Paul really comes alive). That's what he likes. That's his bread and butter. And Daniel and I, we'd do stuff. And then you hit on something. I obviously somewhere, through all of that time, hit on this kind of stillness. And of course Paul spots that and he loves it, so you push it a bit further. It sounds like you and Daniel Day-Lewis built some back-story between the brother and sister. That history was especially very present in the moment when Cyril tells him, "Don't pick a fight with me, you won't come out alive, you'll end up on the floor." We could totally see and believe that he would. Yes, that goes back. Definitely he would. We created a very co-dependent life for them, even as children. They'd have been not parented very well, very absent parenting, because if you were upper-middle class [children] in the turn of the previous century, you wouldn't have seen your parents much. It would have been nannies, and you'd have been left alone. There would have been a lot of loneliness, so there was this enormous co-dependency that would have built up with a huge amount of love. But also at the moments when he needs it, it's like, "That's enough," from Cyril. She almost is the mother. Yes, I detected those maternal instincts there. And when Alma enters the story, I think she also brings in a kind of mothering. But maybe a different kind. Of course! We were all telling him that he can't function in the way that he's choosing to and expect to have people in his life. If he carries on functioning like that, those people are going to recede, go away. Not Cyril, she would never, but if this woman's important to him, he's got to make a huge shift, and that's what the film is about, really. You only need to see one woman in the beginning of the film, who's a lover, a muse, and she's being dispensed with and I'm getting rid of her, and I'm giving her a dress, and it's bye bye. You know that it happens many times. But with Alma, there's a huge sea of change because she's a challenge to him, and he wants it and he doesn't want it, and he wants it and he doesn't want it. And he's got to learn. He's got to be, "Come on now, you've got to be a man. This is what being a grown-up and having an adult relationship entails. You have to let go of some of your ego, some of your megalomania, your narcissism, and get on with it. This is having a relationship." Funny, when Cyril and Alma talk about him, it's almost like they’re talking about a toddler about to throw a tantrum. And ultimately, I love that Alma earns Cyril’s respect. She does, yeah she does. Cyril definitely, when she sees what Alma is made of, the kind of woman that she is, she warms to her hugely. Daniel Day-Lewis puts himself through an arduous transformation process for his roles. So I am wondering if his method kind of shifted anything in the way you usually prefer to work. Was he always Reynolds when he was with you? Yeah, once we started shooting. He comes to the set and he's Reynolds, and you just take that on board. I'm not fazed by that. It's not how I work. It wouldn't be healthy for me to do that, I wouldn't want to work like that. I've worked so much with Mike Leigh where you really do get into character. But the discipline with him has to be that you have your own antennae monitoring the improvisations that you're doing, because you need to debrief and talk about them with Mike afterwards. So you're in character but you can't wholly be in character. For my money, you can never wholly be in character—I can never lose Lesley completely. For me, that's my buzz about acting, that's what I love. I love to push myself right to the extreme, do characters that are really not like me, that are really different. My joy is, when I've done them, get the clothes off, put my clothes on, and I'm me. I need that. If I think of some of the characters I've played on stage and with Mike Leigh in films, if I took them home with me, I'd be ill. I couldn't do it. But whatever gets you through the night. Daniel, for him, has to work the way he works, and I for me have to work the way I work. Really, it's a personal thing. Acting's hard enough. If you need something to get you through it or to help you to create it and see it through, it is fine by me. When you were shooting “Phantom Thread,” was there ever a moment in the script that you challenged, as in, "Maybe this doesn't quite make sense for this character, how about we play or say it this way?" Yes, and Paul was very open to that, and especially because he's not English. Sometimes, occasionally, and I can't give you an example, I remember saying to him, "That sentence you've written sounds a bit American," and he took it completely. I'm the official English person on set along with Daniel. So yeah, he took all of that, but there's no doubt about it, we did at times go off script. [It’s great] when you get good people [to work with.] I couldn't wait for my days to begin on that film, to go in and work with Paul and Vicky and Daniel, to really properly collaborate with them and create this extraordinary film. I loved walking through those doors at 5:30 in the morning and just thinking, "Right, okay, great." We'd go in, sort of talk through the scene, and then we'd all go and get ready and we'd come back, and there we'd all be in these wonderful outfits. Cyril would be Cyril and Reynolds would be Reynolds. It was wonderful. I was talking to Mark Bridges recently. He was surprised when I started our chat by asking him about your wardrobe as opposed to some of the ‘House of Woodcock' designs. The tailoring was exquisite and you carried them so well. I love Mark Bridges and our costume fittings were nothing short of delightful. We had many of them and they would last four, five hours each time. This process started many months before we started shooting. When I first met him, he'd been to Rome, Paris, New York, Los Angeles, London, buying vintage clothes, originals. So we were trying on all these things, looking at shapes, and I thought, "Oh yeah, these clothes are great, just need a bit of TLC.” Little did I know that that was just to look at stuff on me, to take photos, show to Paul, see what we think. Everything after that was designed by Mark and made for me to such a high level of couture. There were women in the film who play the seamstresses, the two older ones. They did work with Hardy Amies back in the '50s, and they now work at the Victoria and Albert Museum in the archive, looking after old clothes. So they came in to advise us, but they ended up being in the film as well. In fact, all the seamstresses in it are either seamstresses, or they are actresses who've got real proper knowledge of sewing. But these two ladies, one day I came in and they said, "Turn around, let's have a look." And they were looking at the zip. They said, "That zip has been put in a way that is just not done anymore. That is real couture and you don't see it very much anymore." So all of my costumes were made and somewhere along the line, we decided that her work clothes would be gray dresses. They'd be very beautiful, very fitted and lovely. Then for the dinners and everything else, [she’d wear] suits and a bit of color: lovely deep navy blues and maroons. I kind of joked at one interview, it's not wholly true but it's a good gag, that I almost had more costume fittings than filming days. And of course, there are the undergarments. I remember my mother later in the '60s putting on this thing that she used to call a 'roll on'. It's like a swimsuit, but it's the whole thing, it's the bra, then it's this whole pulled-in [piece]. It goes down and it incorporates the suspender belt and everything. I had one of those on. That must have also informed the way you carried yourself a bit. Yeah, it does, it does. But you know, that way of Cyril walking—especially because we didn't have carpets in the hallways, you can hear that clip, clop, clip—I thought it needs to be so neat. This little walk is important. But yeah, all the undergarments helped. Not good to eat lunch in them. You’ve done a lot of stage and film work. I'm wondering if these two types of acting inform each other for you. Do you have a preference between the two forms of art? I think they do inform each other. Preference, no, but I love the fact that I do both. Too long without doing a play, and I'd get really itchy, because it's the ultimate test for an actor. Which is why so many film actors who haven't been on stage want to go. "I'm going to go on stage, because I know that if I can do it on stage, if I can hack it on stage, I'm okay." I've seen bad performances edited to look good on film and television. You can do it, but stage, no. You can't fake it. I'm a bit like what Paul says, bit of a control freak. I love the fact that nobody's going to stop me, that the arc of the evening is my responsibility, along with the other actors'. But I equally love the challenge of filming: you might have to do a very emotional scene maybe 20 times in a row. It's a technical challenge. You have less sense of the whole thing, because the director has the sense of the whole thing. And indeed, once you finish shooting, the director goes away and can make the whole thing absolutely how he or she wants it to be in the edit room. I've had an extraordinary year. The year started with "Phantom Thread." Then I shot a wonderful series that I do in the BBC called "Mum." Now I'm going to do a play, so I've done all three in one year. As much as I hate this expression, “women of a certain age” as they call them over here, don’t necessarily have their pick of opportunities that are interesting and complex. So I’m really happy you’ve had this amazing year and continue to have a fruitful career portraying complex and interesting women. 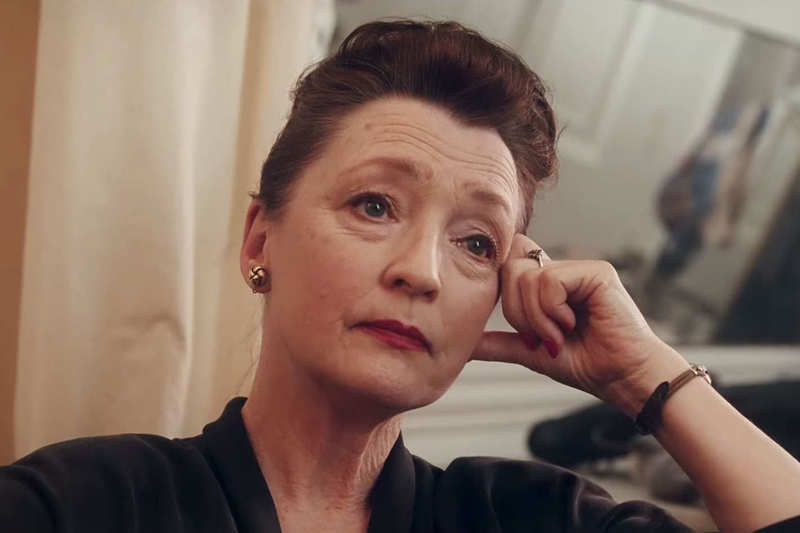 Sometimes as an audience member, I feel starved for films like “Another Year” or "Phantom Thread." I agree. But I think it's getting better. I've been saying this tentatively for about seven years. I think it is slowly getting better. I'm wearing my guilt quite heavily at the moment, because I do have an amazing career and stuff is coming my way. But I've put in the time. I've done many, many, many plays. I've worked with great writers in great theater companies for very little money over the years. I always knew my life and my career would be a slow burn and it has been, and I'm very grateful for that. I was never flavor of the month and why would you want to be? Because what happens when the month changes and then you're not the favorite? It's been gradual, but I do think it's important to have women over 40, 50, 60, 70 represented properly on film. Not just as what men want them to be. Over 60, we are not sexual anymore. Over 70, we are just old. No, none of that, none of that, rubbish. We're absolutely here, we're determining our own lives, and we can be whatever we want to be. Don't tell me I can't wear this or wear that because I'm 61. I'll wear what I damn well like, and celebrate it. So that attitude has taken a long time to filter through, but I think it is filtering through and it is getting better. I've got Cyril, Long Day's Journey into Night, and in “Mum,” I play this rather lovely woman whose husband has just died and she's beginning to find love again. She's not thinking, "Oh, that's it, I'll put on an old dressing gown and some horrible slippers and I'll call it a day on my life." But it's beautiful, it sort of says, "Yeah, okay, we carry on. We keep living," and if you want to, reinvent yourself. You can if you want to. But listen, the only choice you have, as an actress, is to say “yes” or “no.” The projects have to be written and have to be there first.